A finishing touch for the truly elegant! Crafted in solid 18K gold with inlaid AAA grade Lapis Lazuli. Bold and contemporary cuff links: a solid, extra Blue Lapis Lazuli bar cylinders are gripped by a handmade 18K gold setting. A Lapis Lazuli World exclusive! Bold! Handcrafted in solid 18K gold with inlaid Grade AAA Lapis Lazuli. Also available in Malachite and Obsidian! These cuff links measure 0.66 inches tall x 0.56 inches wide. Handcrafted in solid 18K gold, with an inlaid Lapis Lazuli design. These cufflinsk measure 0.66 inches W by 0.66 inches L.
Extremely fine and elegant: These cuff links are handcrafted from solid 18K gold, ans adorned by the finest AAA grade Lapis Lazuli (they are also available in Obsidian). The cuff link face measures 0.70 inches w x 0.70 inches L.
Very elegant! Handmade Sterling Silver cufflinks and studs, with braided 18K gold detail and Grade AAA Lapis Lazuli accents. Also available in Obsidian. These cuff links measure 0.79 inches long x 0.51 inches wide. 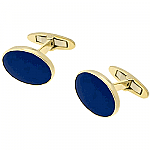 Exquisite Cuff Link Pair, crafted in solid 18K gold crown by two inlayed oval Lapis Lazuli stones. Also available in Malachite and Obsidian! Exquisite Cuff Link Pair, crafted in solid 18K gold crown by two inlayed rectangular Lapis Lazuli faces, with gold division detail. Also available in Malachite and Obsidian! These cufflinks measure 0.66 inches tall x 0.51 inches wide. Original Toggle desing, crafted in solid 18K gold. These cuff links at topped by oval inlayed Lapis Lazuli stones. Also available in Malachite and Obsidian. Exquisite Cuff Link Pair, crafted in solid 18K gold crown by two inlayed rectangular Lapis Lazuli faces. Also available in Malachite and Obsidian! Exquisite Cuff Link Pair, crafted in solid 18K gold crown by two inlayed square Lapis Lazuli stones. Also available in Malachite and Obsidian! These cufflinks measue 0.66 inches tall x 0.66 inches wide. These cufflinks measure 0.66 inches tall x 0.56 inches wide.